270J6 Poly-V Belt. 27 inch 6 rib for Auto Planers, Drive-Gear-Motor Belt. 270J6 Poly-V Belt (Consumer brand), Metric 6-PJ686 Motor Belt. 270J6 Poly-V Belt. Consumer Brand. 27” Length. 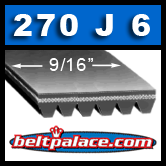 PJ686/270J 6-Rib drive belt replaces fitness belts, compressor belts, drive belts, and electric motor belts. 270J-6 Micro-V Belt. J-246-4 NON BELT for Harbor Freight-Central Machinery Planer-Thicknessers. Marked as 97J belt, 4 ribs.